Is your couch feeling a bit stale? Are you finding yourself hesitant to rest your head on the cushions, or do you pick up a whiff of an unpleasant odor during your evening lounge time? If so, it might be time for your furniture to receive a rejuvenating deep cleaning. It is essential to keep household furniture clean, and it is recommended to have frequently-used furniture cleaned once per year. A sofa is where the family gathers to read stories or cuddle up and watch a movie together. A favorite chair is where you enjoy your morning cup of coffee, or get lost in a favorite novel. You could unknowingly be spending a great deal of your time sitting on furniture that is home to germs lurking within. So, what kinds of bacteria unwelcomingly take up residence inside of your furniture? This common bacteria can live on soft surfaces and cause a whole host of health issues, including impetigo, cellulitis, stomach upset, and pneumonia. Although most do not think twice before wiping down hard surfaces after a family member is sick, the majority of us do not even consider cleaning the furniture. Pseudomonas are bacteria that are ranked in the Pseudomonas family. These bacteria are highly diverse and are able to colonize in a wide range of environments, including inside furniture. Their ability to survive under harsh conditions means that a deep cleaning is necessary to rid the furniture of infestation. These bacteria are found in plants, groundwater, and soil and are unknowingly carried inside by people and animals. Infection can cause skin irritation, bacterial keratitis (eye infection), headache, fever, and ear infections, among other symptoms. Aspergillus versicolor is a fungus often found in furniture and growing on carpets, and is regarded as one of the most common indoor molds. It emits a characteristic "musty" odor. This fungus can irritate the eyes, nose, and throat, cause respiratory symptoms, and in severe cases can cause serious, and hard to get rid of, fungal infections. These are just a few examples, yet there are countless other germs that could be taking up residence in your furniture. How do these germs find their way into your humble abode? Well, while some are spread through contact with a person who is ill (such as with Staphylococcus), the others live in the soil around the home and are tracked in from outside, by humans or animals. Research studies have verified the link between contaminated soft surfaces and the transmission of infection! Often deep-cleaning the furniture is completely overlooked during a cleaning routine because it is a time-consuming and difficult job. So what can be done to ensure that your and your family's heads are resting on a surface free from infestation? 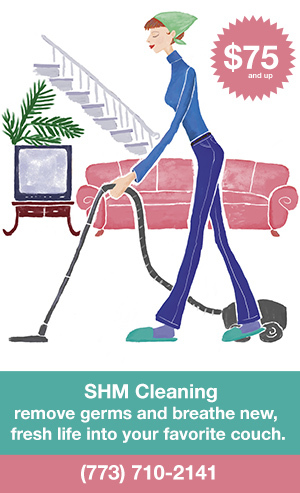 SHM Cleaning has got you covered! For just $75+, SHM Cleaning will remove germs and breathe new, fresh life into your favorite couch.